It’s been three days since the school shooting in Parkland, Florida, and we can’t imagine what the Parkland community must be going through. And while we want nothing more than to provide words of comfort and support, we don’t know what to say. That’s why, when we heard Jacob the comfort dog was in Florida to support survivors of the Parkland school shooting, we sighed in relief. We know the survivors in Parkland are in good hands. Or rather, good paws. Jacob’s support services can’t come swift enough. As more disturbing details emerge about gunman Nikolas Cruz’s history of violence against women and confirmed ties to a white supremacist group, the Parkland community finds itself not only mourning the loss of loved ones, but also trying to make sense of how this happened. How could one of their own carry out such an unspeakable act? But for the grief-stricken, sometimes the company of a furry friend like Jacob the comfort dog can do a lot of good. 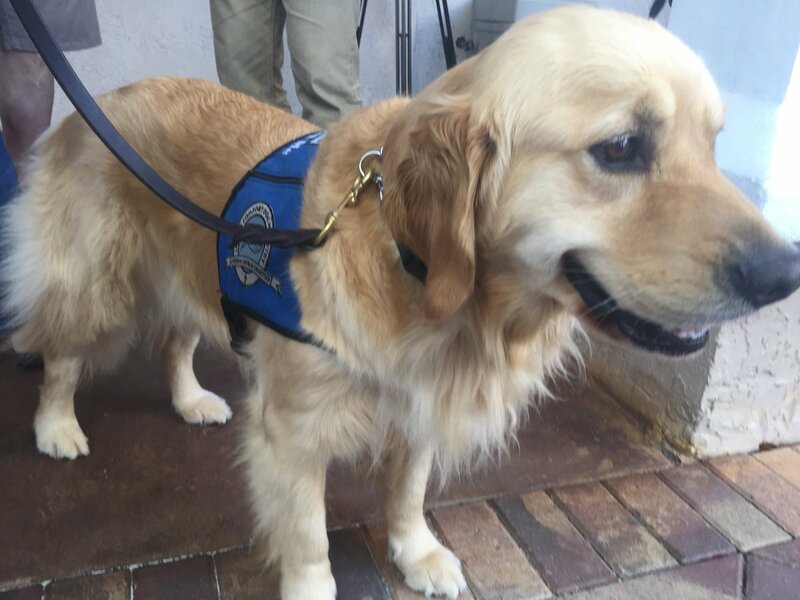 After Cruz opened fire on students and teachers at Marjory Stoneman Douglas High School on February 14th, killing 17, the Lutheran Church Charities K-9 Comfort Dogs Ministry deployed a few dozen of their specially trained comfort dogs to provide some much-needed solace to survivors. Launched in 2008, the K-9 Comfort Dogs Ministry trains comfort dogs like Jacob to interact with people of all ages and circumstances who are suffering after a traumatic event. The dogs bring comfort to all those touched by tragedy, including survivors, first responders, and the volunteers who serve them. Jacob the comfort dog to the rescue! And 4-year-old golden retriever Jacob and his four-legged pals are making the rounds in Parkland. According to Lutheran Church Charities CEO Tim Hetzner, the dogs do not bark, bite, or jump up. They’re taught to remain calm and soothe people in distress. But comfort dogs like Jacob do more than just provide a pet to…well, pet. They lend a friendly ear, too. It’s a skill Hetzner has witnessed in action following mass shootings at a church in Sutherland Springs, Texas, a music festival in Las Vegas, Pulse Nightclub in Orlando, and — unfortunately — many more. The @LCCharities @K9ComfortDogs are going to be at the Pine Trails Rec Center today. While we struggle to find the words to express our condolences to the Parkland community, we’re glad to hear Jacob the comfort dog — and other doggos like him — have paws on the ground.